on many things randomly and in no particular order: Archer Season 4 in the UK: A legitimate case for piracy? 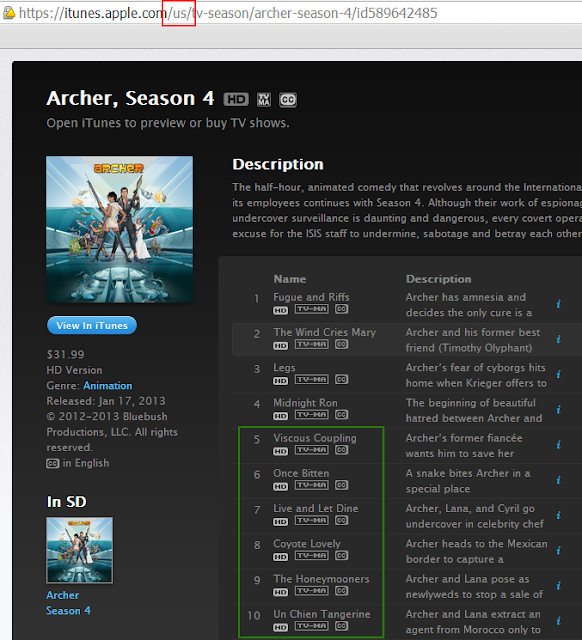 Archer Season 4 in the UK: A legitimate case for piracy? After watching Archer seasons 1-3, my wife and I naturally moved on to season 4. After watching the first four episodes we realised that then next available episode in the sequence was episode 8. So the natural question is where are episodes 6 and 7? A quick search reveals that neither Netflix UK, blinkbox nor iTunes in the UK currently have these episodes even though they've aired in the US in February according to the Wikipedia article. So, why is this content, long available in one region, missing from another and on top of that, aired out of order? A scheduling glitch or some kind of outstanding rights issue? I am going to put my consumer hat on now and stay that "I simply do not care" either way. I'd like to pay for and watch my episodes, in the correct sequence and in timely manner and if I can't, I will take my money elsewhere. I propose that this is exactly the case where people who would otherwise pay for content, would turn to alternative sourcing methods. In this case, the entire season 4 in full HD can be downloaded in minutes, with your favourite BitTorrent client, using one of the many trackers set up for this purpose.